If you’ve been a middle school teacher for more than a hot second, you know that those kids are social! They want to talk and work with friends! 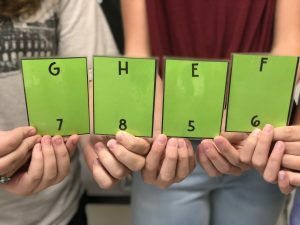 Every time I’m done giving directions, at least one student in every class asks, “Are we going to work in groups?” Ultimately, I have to orchestrate group work and it can be either really easy or really difficult. Option 1: Easy. Kids make their own groups. This is too lenient for how I run my classroom and leads to goofy behaviors or students feeling left out of peer groups. Occasionally, it’s totally fine. Option 2: Complicated. I go through each class and put groups of kids together. This is so time-consuming because I’m thinking I know for sure these two kids can’t work together… and this kid and this kid are best friends…. and this kid is always working when he’s next to this kid but not next to this kid. So this becomes a huge a jumbled puzzle that takes me some time to figure out. Or I can create an account on some website and type (ugh) in all the kids names for all my classes. 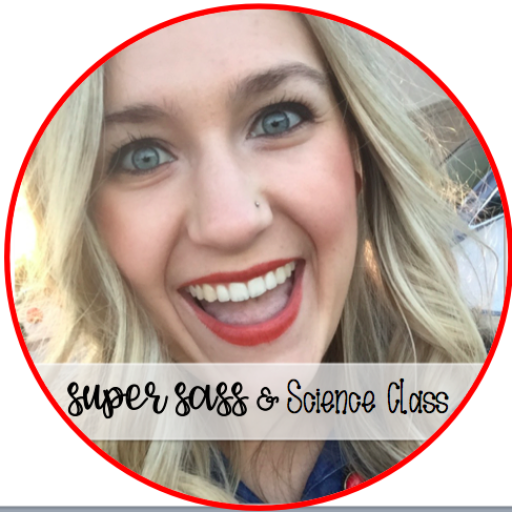 The problem occurs when kids are absent or their schedule changes and they’re not in first hour anymore – and really, who has time to remember to move the kid’s name on the grouping website… what was my login to that anyway?! Their number. Students are grouped by the numbers on their card. When I tell the students to go into groups with their number, all the ones go to table one all the twos go to table to all the threes go to table 3 and so on. Their color. 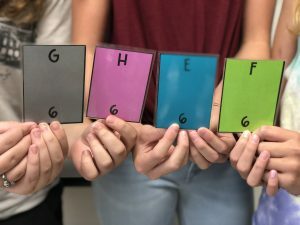 Students are grouped by the color on their card. If I tell them to go to their colors, the pinks will go to the pink table, the oranges go to the orange table… and so on. Their letter. Students are grouped by the letter on their card. I feel like you get it by now. The number of students in a class does not matter even one bit. 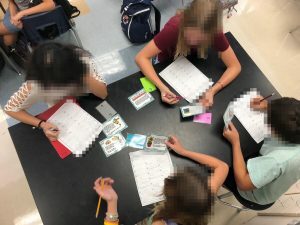 If three kids are absent or one gets their schedule changed, it won’t impact how I use the grouping cards. Take out a set of colors or numbers, and add WILD cards if you need to – I’ll get to those in a second! After I pass out the cards, I’ll call out which group I want them to go to. Of course, this is the last thing I say because after that, they won’t hear a word – they’re so anxious to get going! This is where the magic happens. Let’s say I told them to go to their letters. Against all odds, that group of four boys that cannot stop giggling ended up together. I can quickly say, “Never mind! Go to your color!” and I know all four of those boys will be separated, because none of the cards have the same color, letter or number. If they do end up in the same group, I know they’re cheating! I LOVE this strategy because it’s easy to do on the fly and it is so flexible. Because sometimes you don’t plan for things and groups just suddenly need to happen. Or I don’t want to spend my night making groups. The WILD Card was born from a year when I had a class of 38 seventh graders! I only had 8 lab tables, which meant I always had to make a few groups of five. 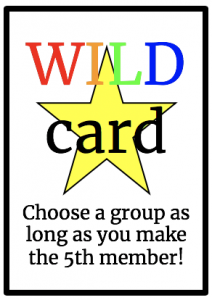 The WILD Card says, “Choose a group, as long as you make the fifth member!” Because they are shuffled into the deck, different kids got them every time and were so excited to get to choose. When I didn’t need them, I took them out. Easy as that. While I mostly use these for group work, sometimes I need to get the kids to get out of their normal rut. Occasionally I will let them work with their numbers for eight minutes, with their colors for eight minutes and then with their letters for eight minutes. So over the course of the class, they get to work with 11 other people on the same assignment but they didn’t work with friends the whole time. I will say it again. This is the best classroom management tool I have ever used. The structure moves kids efficiently, but the flexibility to change things up is perfect for a classroom. 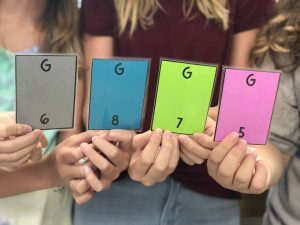 Grouping cards are a LIFESAVER for any teacher! Quick disclaimer, especially for new teachers. 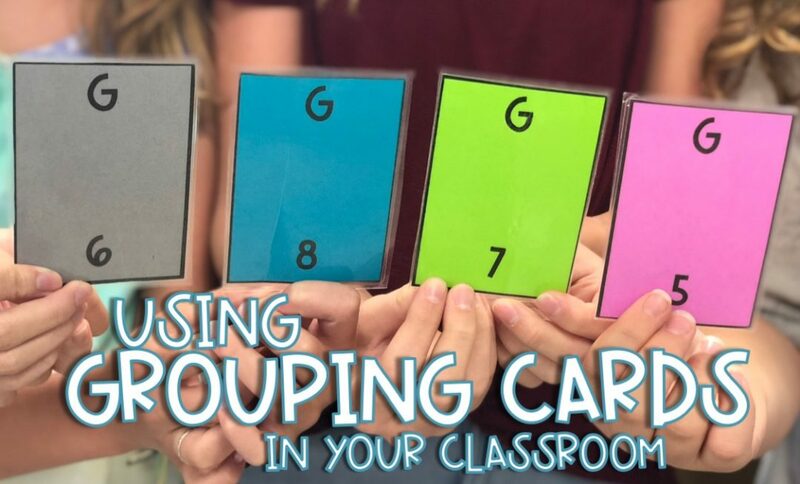 While these card will help your classroom management, introducing these cards will require you to model like crazy. Kids need to know that there is a specific procedure for how to use these. When you pass them out the first time, explain how to use them. Have all the twos raise their hand and then have everyone point to where the twos go. Repeat this with all the blues or all the As. Randomly call out a few groups before you decide on letters, numbers, or colors. Students will start to get the idea.